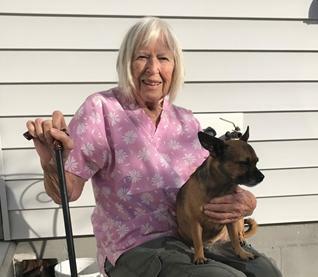 A loan of $3,000 helped to help pay for a small solar system for Delores' home to help lower her electric bills and lessen her impact on the environment. Delores is a single, elderly woman who is trying to remain as independent as possible. Delores has raised her children and now lives in a modest home that she is quite proud of and that she has worked hard to maintain. Recently, Delores began seeking advice regarding the installation of solar panels. She realized that Florida is lagging far behind other states in regards to the installation of solar panels even though Florida is the "Sunshine State." Delores is environmentally conscious and, although her funds are limited, she would like to do her part to help the environment and save money on her electricity bills. Delores is hoping that SELF and Kiva can help finance a portion of her solar project. It helps women homeowners and veterans with poor credit history save energy and money. Solar and Energy Loan Fund, SELF, focuses on community development projects in underserved areas in Florida, with an emphasis on home energy improvements. SELF uses Kiva financing to help female homeowners and veterans save money on home energy and build or strengthen their credit rating. These in-kind loans will be given in the form of energy efficiency upgrades or retrofits, and provided to low-income female homeowners and veterans that may not have solid credit history, but have income to repay a loan. Kiva supports SELF’s mission to improve energy efficiency in low and mid-income homes, to both save energy and save money for the homeowners. Kiva also supports SELF’s goal of helping low-income women strengthen their credit ratings through the successful repayment of in-kind loans. Through SELF’s in-kind loans of energy efficient retrofits, the individual community and environment can benefit.